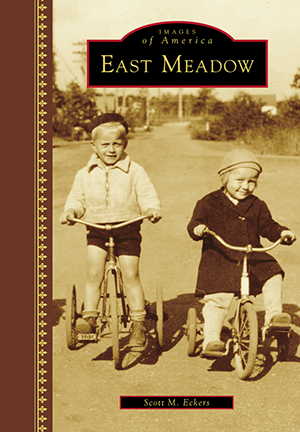 ​Following World War II, East Meadow developed into a suburban paradise some 20 miles east of New York City. The hamlet’s name was derived from its proximity to the colonial settlement at Hempstead and the topography of the Hempstead Plains that covered much of present-day Nassau County. East Meadow was once known for herding sheep, raising cattle, and growing potatoes—livestock frequently outnumbered the human population. Large farming estates of the Barnum, Carman-Lowden, and Fish families drove the local economy and existed alongside smaller farms and businesses that dotted the colonial-era roads. East Meadow was also home to high-society Gilded Age mansions, dangerous automobile races, stylish polo and golf clubs, and famous residents such as Eleanor Roosevelt, Joseph J. Lannin, and Alva Vanderbilt Belmont. Proximity to Mitchel Air Force Base and Roosevelt Field placed East Meadow directly under the path of important airplane firsts, such as Charles A. Lindbergh’s 1927 transatlantic flight.